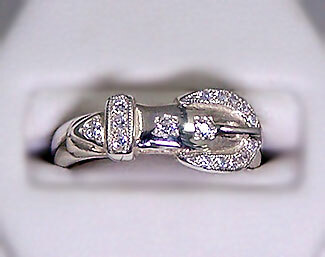 Beautiful Buckle ring with CZ's make a great gift. Pictured and priced here in Sterling Silver. This gorgeous buckle ring has all the bling for a fraction of the cost. This is a great gift for someone who likes the sparkle but can't afford the real thing. This ring is also great in 14kt yellow gold, or 14kt white gold. Dimensions of this ring are: 9mm wide at the top of the ring tappering down to 5mm wide at the bottom of the ring.